After a knee surgery M. did a follow up with therapies and was still going regularly to the doctor for treatments to try to restore the motion. A year and a half later she contacted me to try Yoga to support her healing process. She was still having difficulties and wanted to try another approach to complement with what she was already doing for her betterment. We noticed a certain disconnect. Her body was not responding to her mind. It was some resistance and profound pain response mechanisms. Most of the mechanisms were set into her muscle memories and pain memories. Though the pain was not really present anymore in her knee at the moment. She experienced high sensitivity in her back and neck. We began a gentle mindful practice to release the trauma that was still so present into her whole being. 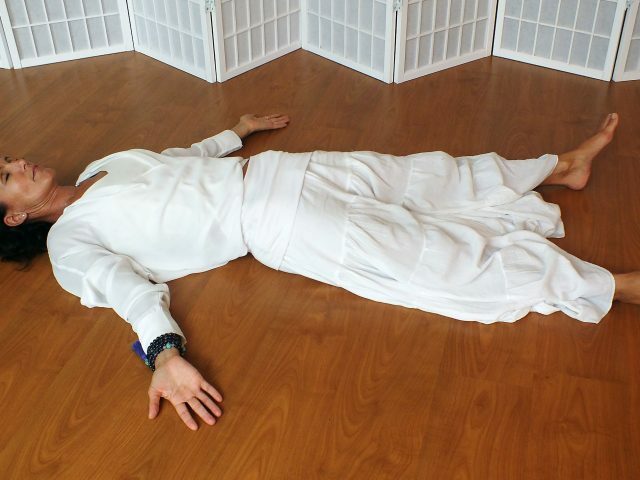 Through DHARMI-YOGA® the steps moves through all Five Bodies along the practice. We first set the intention of Healing and then began to access that source of energy with the breath. 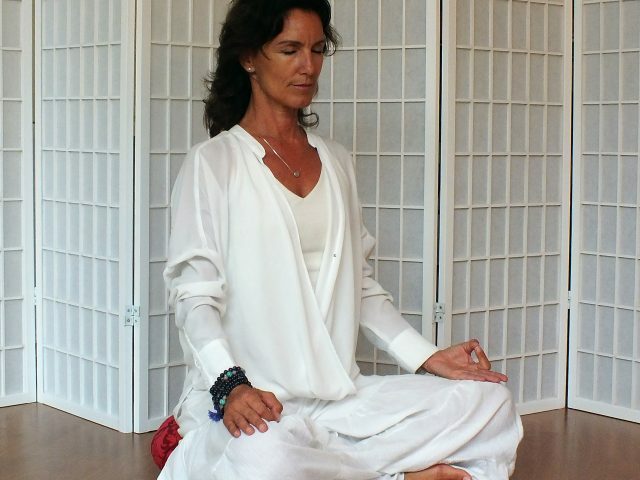 She was seated in a comfortable posture, opening her mind and body to heal. Her mindset was apprehensive and it took a few minutes to pass through those first steps. We don’t move forward until the mind is opening up to the possibility of healing. When she began to release the apprehension, I noticed a clear shift in her breath and energy field. It is then that we chanted to link her base, her navel center, heart center, vision and connection. We moved through a gentle practice to rekindle the different part of her body, as well as the five bodies: breath, movement, emotions, physical and spiritual. Whenever she met some resistance I invited her to explore the sensations and to visit what was holding her back. Until she could pass through with compassion and acceptance of what is. We used the wall and a block for a Virabhadrasana I posture. The leg where she had the surgery was not responding to her mind command. This triggered fear and frustration, and her own judgment towards her emotional response were not helping. She came back to focus her attention to her intention of Healing. With compassion she visited the emotions and response mechanism and took a few breaths. Surprisingly she noticed a relief and could access her leg without any pain. It was the pain memory that was triggering fear (Water Element) and created an automatic disconnection between her mind (Air Element), her action (Fire Element) and the manifestation, embodiment (Earth Element) of her intention (Ether Element). After a first practice she could sit and stand without support. She followed up with a few private classes for more profound integration, rekindling and building up confidence. A mindful DHARMI-YOGA® Practice supports healing of PTSD after surgery.